Emotional Intelligence (EI): Your ability to manage and understand emotions and relationships, your own as well as others’. Research has shown that Emotional Intelligence is more vital to life success and satisfaction than general intelligence. This makes EI a very important skill for parents to teach their children. The good news: Children automatically learn EI when they are raised by parents who have it themselves. Parents with EI are able to understand what their child is feeling and why. Their emotionally attuned responses to the child model and teach him how to read, understand, and respond to his own and others’ feelings in a healthy way. The bad news: A parent who struggles with EI himself may lack the skills necessary to be able to teach them to his child. In other words, you can’t teach your child what you don’t know. This is why low EI is self-perpetuating through generations of families. 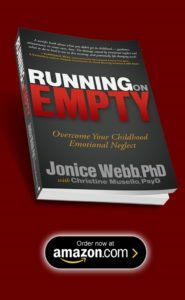 One way to make sure that you do not teach your child about emotion is to simply ignore his emotions while you are raising him (Childhood Emotional Neglect). If you seem not to notice that your child is upset, sad, angry, hurt or anxious, you are subtly telling him that his sadness, anger, pain or anxiety don’t matter. You are teaching him to ignore his own feelings. Emotionally neglected children grow up to experience a variety of challenges, only one of which is low Emotional Intelligence. As adults, these children also struggle with excessive guilt and self-blame, feelings of emptiness, and a general lack of joy in life. No loving parent wants to set her child up for that scenario. But parenting is probably the most complicated job in the world. 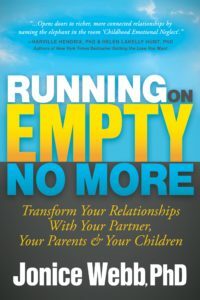 In fact, it is built into the natural process of parenting that even the most loving parents will pass our own strengths and weaknesses on to our children. Often, the only way to stop that cycle is to consciously make the effort to override it. Pay attention. Work hard to see your child’s true nature. What does your child like, dislike, get angry about, feel afraid of, or struggle with? Feed these observations back to your child in a non-judgmental way so that your child can see herself through your eyes, and so that she can feel how well you know her. Life Advantage: Your child will see herself reflected in your eyes, and she will know who she is. This will give her confidence in her life choices and will make her resilient to life’s challenges. Feel an emotional connection to your child. Strive to feel what your child is feeling (empathy), whether you agree with it or not. When you feel your child’s emotion, he will feel an instant bond with you. Life Advantage: Your child will learn empathy and will have healthier relationships throughout his life. Respond competently to your child’s emotional need. Do not judge your child’s feeling as right or wrong. Look beyond the feeling, to the source. Help your child name her emotion. Help her manage the emotion. 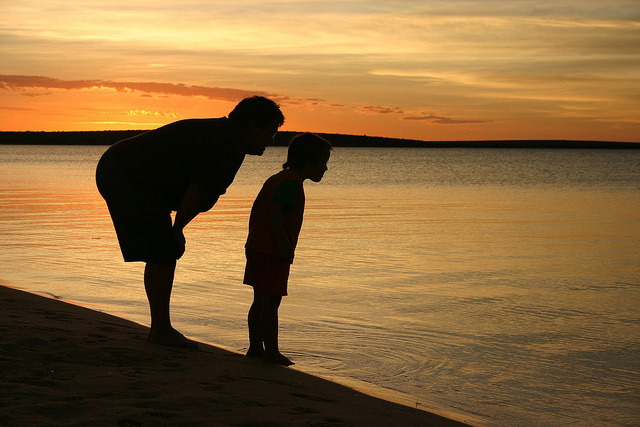 Life Advantage: Your child will have a healthy relationship with his own emotions. He will naturally know that his feelings are important and how to put them into words and manage them. 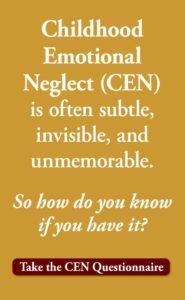 Childhood Emotional Neglect (CEN) is often invisible and unmemorable. To find out if it is at work in your life, Take The CEN Questionnaire. It’s free. I had an amazing breakthrough today because of deliberately sitting with all those awful feelings, differentiating old roots from the current emotions of an issue 3 days ago. It took lots of checking in and journaling, and lost sleep, but this morning I dealt with a cheating student in a quiet and compassionate way, not judging, just being realistic and sitting beside him to get him doing his work. No anger or argument about reporting it followed; the kid understood. Then, a coworker overheard my teaching a rowdy bunch so that they settled down and worked hard. She complimented me in front of my boss in very specific ways. I was so moved that I gave her a hug (we’re well acquainted). My boss then gave me a side hug and validated me by saying how glad he is that I’m teaching there and am such a diverse asset handling so many different subjects. Right now, I still feel the validation, the honest caring of both of them, and can fully accept their compliments! My whole life has been spent deflecting praise and compliments as not necessary; it just may be that my love languages are physical touch and words of affirmation. And these were healthy expressions of both. Is this how other people feel? Wow! It’s painful when bad, but fabulous when good! What a great story Vicki. Thanks for sharing it as it will help others see the value of dealing with their feelings too. Keep up the good work! I have never understood many of the feelings that have swept over and around me throughout my life. After reading your book, it is crystal clear to me why. After a lifetime of not feeling my emotions, the long hard journey back to the place of origin has begun, and while I struggle with anger towards my parents, I must remind myself constantly that they, too, were raised by people with little emotional intelligence. Thank you for your incredible work. Thank you.